MEXICO - Over the last four weeks, liveweight hog prices in Mexico showed an average of 27.6 MXN pesos/kg (67¢/lb USD), up 14 per cent compared to the same period of time in 2015, writes Fernando Ortiz, Genesus Ibero-American Business Development. For the last 4 weeks, Mexico City has recorded an average of 28.1 MXN pesos/kg (68¢/lb USD) liveweight, a higher average of 16.6 per cent from the same 4 weeks the year before. The following table shows three key Mexican regions in terms of price of pork (all prices are in Mexican currency). At the bottom is the National Average Price. The important point here is that Mexico has not only maintained a good price, but that it has risen slightly from one year to another despite a substantial fall in pork prices in the United States. 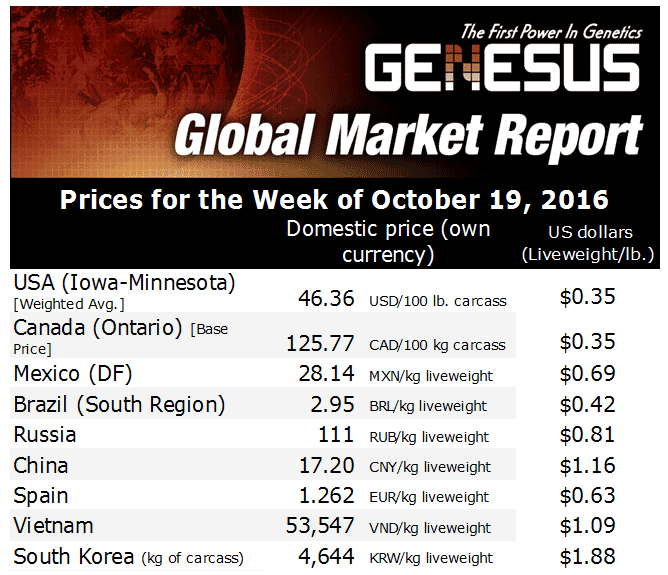 Mexico still has decent prices that allow producers to obtain margins of about $30 per head. How long will this last? We believe that it will not last long. Historically, low prices in the US have caused an overflow of American pork into Mexico, and consequently exert great pressure on the domestic price of pork. It is only a matter of time before we begin to see the impact of the current North American markets reflecting realities in Mexico as well. The old economic adage is that when the US pork price catches a cold, the Mexican pork price catches pneumonia. If Mexican producers are looking for some comfort on future prices, there is one, and the good news is that pork consumption in Mexico has reported a growing trend over the last two years (about 3.3 per cent). Jalisco and Sonora are the main pork producers by state, contributing 18.9 per cent and 17 per cent of the domestic supply in 2015, respectively. Next in order of importance are Puebla (12.3 per cent), Veracruz (9.2 per cent), Yucatán (8.6 per cent), Guanajuato (8.3 per cent) and Michoacán (3.2 per cent). However, Sonora and Yucatan are the foremost pork export States. Two years ago, the Mexican Peso was 12.50:1 against the USD. From them to now, there has been significant dollar revaluation, like with most of the other currencies around the world. This week the US dollar was quoted around 18.50 pesos after crossing the 19:1 mark last February. Other countries’ currencies devaluation look like this: Russia, (86 per cent), Brazil (52 per cent), Canada (18 per cent), Euro (20 per cent), South Korea (19 per cent), British Pound (17 per cent). Mexico currency devaluing by over 30 per cent is detrimental, but it could be worse. In the worst case scenario, producers are buying more costly imported grain than before (even when grain prices are lower in price than in the country of origin). Since the price of a country's currency affects the price of their products on world markets, the currency's exchange rate can have a big effect on national exports and costs of imports. On the other hand, Mexican pork exporters are earning more margins by putting their product overseas. With the rise of the dollar, Mexico has enjoyed a surge in exports, especially to the US. Why Mexico is taking such a hit doesn't really make sense, as Mexico will enjoy 4 per cent GNP growth in 2016, nearly double that of the US. In a backhanded way, the fall of the peso has stimulated economic growth by lowering the cost of Mexican-produced products in the world's largest consumer nation, the United States. There have been at least a half dozen reasons for the peso and other currencies to remain weak against the dollar, as the world’s economic conditions remain fluid. Mexico’s pork industry is projecting to expand a little bit further on international markets with a clear focus in Asia. With 1.4 million tons of pork production projected for 2016 (USDA projection), Mexico is still far to from self-sufficient. It is estimated that the consumption of pork in Mexico would increase 3.3 per cent during 2016, to stand at 2.2 million tons (carcass). Since 2012, Mexico has expanded pork exports about 30 per cent (2012, 70,000 tons – 2015, 100,000 tons). Having said that, Mexico’s pork imports is about 1 million tons a year -for a value of more than $1,785 million US dollars- representing 14 per cent of imports of pork (meat and by-products) worldwide. The main supplier, prominently, is the US, which accounts for 84 per cent of sales -over $1,500 million US dollars. It is followed by Canada with $250 million value. Between both, they add around 98 per cent of the volume and value of pork imports from Mexico. We were visiting several pig producers and packing plants in Spain over the last two weeks. My feeling is that Europe’s packing plants, especially those from Spain, are focusing right now to target markets like Mexico and Colombia. The recently confirmed opening of the Mexican market to fresh pork from Spain is being seen by the European Commission (EC) as the first step in a process which will deliver similar export breakthroughs for other EU member states. There is some potential in this market, but European exporters should be ready to face fierce competition with its North American counterparts in terms of price, due mainly to significantly higher freight costs. Mexico’s main pork import are hams. Ham is a relatively low value pork product in North America, while hams in Europe, mostly in Spain, are costly. I am not sure if Spain could afford to ship hams to Mexico to compete with those very cheap American ones. Now, if they (Spaniards) are thinking to add some value on them, it would be a different story. In that case we would be talking about cured or cooked hams; areas where Spain has a lot of expertise. Mexico is quite a large pork importer, taking around 1 million tons last year, but, as I already mentioned, most comes from the US (84 per cent) and Canada (14 per cent). There is, however, some room for sending offal to this country. Mexico is getting around 200,000 tons of offal/year. There might be more chances for the EU’s products to compete in that market, although currently the US and Canada dominate again.